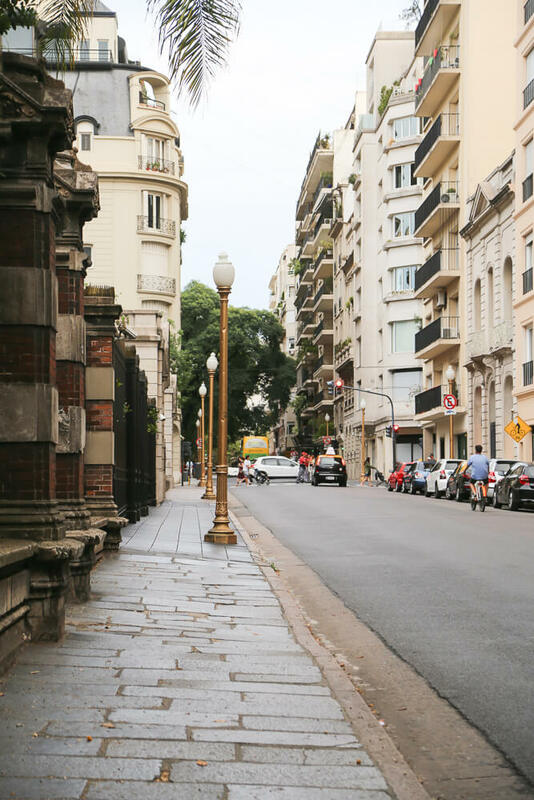 Recoleta is a residential neighborhood and is markedly wealthy. If you were looking for the Paris of South America, this is it. More affluent families fled the popular southern neighborhoods in the late 1800's when a yellow fever outbreak pushed families out. Recoleta and other neighborhoods further north were developed by these families fleeing the epidemic. Recoleta especially prospered due to its geography. Its higher terrain prevented insects that spread the disease. This is why the northern barrios remain more wealthy, while the more underprivileged remained in the southern neighborhoods like La Boca. The city remains divided this way. What does Recoleta mean? The Monastery of the Recollect Fathers (members of a Franciscan Order), made this area their home at the beginning of the 18th century. They founded the church dedicated to Nuestra Señora del Pilar and its adjoining cemetery. Recoleta holds a special place in my expat's heart (I could probably find a reason to say that about any neighborhood). When I first visited in 2009, I stayed with my best friend who was living in the heart of Recoleta. 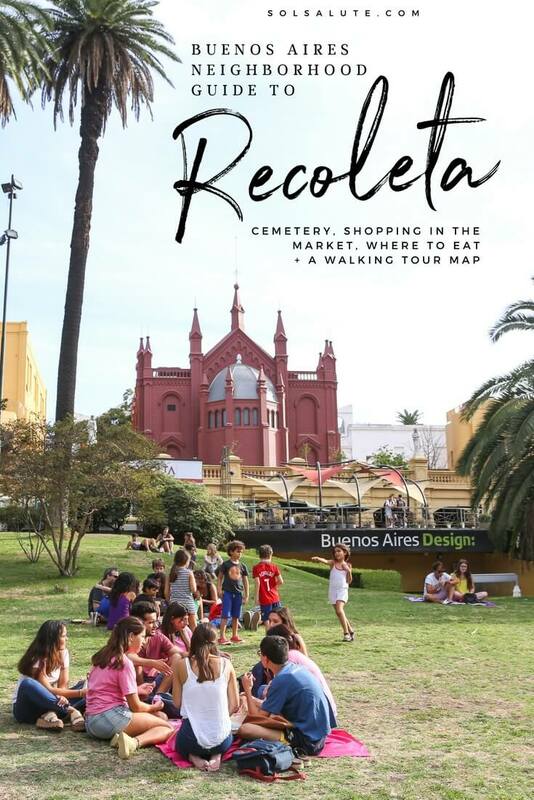 Me and my husband's second date (the date that I planned), was to be tourists at the Recoleta Market. When my parents came to visit me in Buenos Aires, this is where he met my parents. I don't make it here often, but when I make the effort to visit I'm always glad I did. I'll write about all of the highlights you can't miss in this post, there's a lot! And I'll be mentioning them in an order that would make a great walking tour. Don't miss the list of my favorite restaurants and bars at the end. Also at the end of this post is a Google Map marking all of the stops and the walking route, so you can plan your own self-guided walking tour of the area. La Isla (or the Island) is sort of a mini-neighborhood within Recoleta, an uber-elite area within an already elite neighborhood. All of the territory that makes up La Isla was originally owned by one family, the Hale-Pearsons. At the beginning of the 20th century, the land passed hands to a British firm who decided to turn it into a subdivision. It was successful and large mansions were built surrounded by parks and plazas. Only one of the original homes remains and houses the British embassy. Walking? You can start at the corner of Las Heras and Aguero. First, take a peek at Aguero 2391. The building here has heart-shaped security bars on the window, decorated with lovers locks from locals in love. From here take Galileo street to walk through La Isla, passing the British Embassy and coming out onto the Plaza Mitre for a beautiful view. National Museum of Fine Art. The museum is open every day except for Mondays and is free of charge. If you want to see Argentine art, you'll be happy with this museum's permanent collection and 24 exhibit halls. This enormous aluminum and steel flower was a gift to the city from Argentine architect Eduard Catalano. The petals are designed to open and close, opening at 8 am and closing at sunset. The name refers to the architect's desire that the flower represents all of the flower in the world (generic flora...). Catalano is quoted saying that the Floralis Generica "is a synthesis of all the flowers and, at the same time, a hope reborn every day at opening." Leaving the Plaza de las Naciones Unidos and the enormous flower behind, it's impossible to miss the gigantic, columned Law School. Walk along the base of the steps towards the bridge crossing Libertador Avenue. 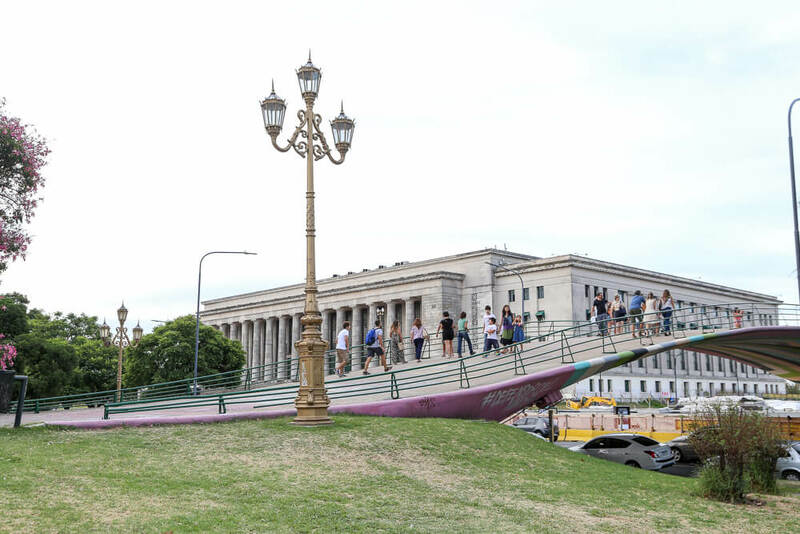 Past the law school, just behind the bridge, you can rest your feet in the Plaza Republica Federativa del Brasil (that's a mouthful!). There's still a lot of construction in the area, but this new park adds 55,000 square meters of green space and public park to the city. It's modern and eco-friendly, worth taking a peak. Take your time crossing the pedestrian bridge over Libertador. Take in the politically charged graffiti below your feet (would you expect any less next to a law school filled with politically conscious youth?). (Did I just say youth?) (Does that mean I'm no longer a youth?) (sorry). The view down Libertador towards the Floralis Generica is stunning. This is a great spot during sunset if you happen to be here towards the end of the day. Just across Pueyrredon after you cross the bridge, you'll find Plaza Francia. Every Saturday and Sunday, from midday to around 8 pm, there is a market here, the Feria de Artesanos de Plaza Francia. It’s one of the many great outdoor markets in Buenos Aires, read about my favorites here. This is a great time to visit the area, the plaza really comes to life on the weekend. Tourists and backpackers come to shop for leather goods and handmade souvenirs. Locals also descend on the plazas and parks with groups of friends to drink mate and enjoy the fresh air. This church, dedicated to Our Lady of the Pillar, was built in 1732 by the Franciscan monks I mentioned earlier. This is the second oldest church in the city, just behind the Iglesia de San Ignacio in San Telmo. The most famous attraction in Buenos Aires is without a doubt the Recoleta Cemetary. Also built by the Franciscan monks it was attached to the church next door. Not to be morbid, but the cemetery is a veritable who's who of Buenos Aires political history, with past generals and presidents as well as noble prize winners and writers. Fight the temptation to just find Evita's grave and leave. Allow yourself ample time to wander and get lost here. The cemetery is open every day from 8 am - 6 pm. There are free guided tours in English at 11 am on Tuesdays & Thursdays. Pro Tip: Head around the corner to the Recoleta Shopping Mall, go to the top floor food court. The Mostaza burger restaurant has a balcony with a birds-eye view of the cemetery! Stop for a coffee break in Cafe La Biela, just across the plaza from the cemetery. The cafe has been around since 1850, originally called La Viridita. 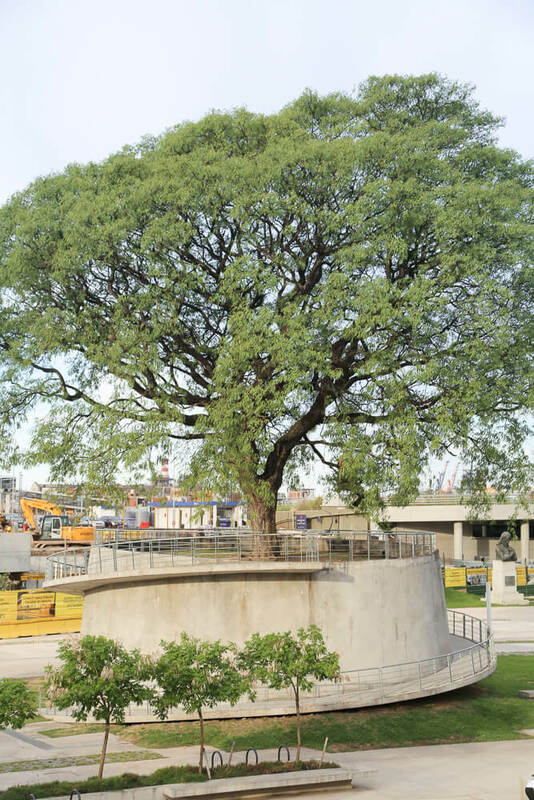 Grab a table outside under the shade of a huge rubber tree, said to be the oldest tree in the city. Many branches need to be sustained to avoid them breaking from their own weight. There's a statue of Atlas holding up one of the largest branches, made mostly from metal recycled from cars. Don't forget to take photos in the randomly placed English red phone booths put here by President Menem. CAMPING| Av. Pueyrredón 2501: Camping is located just off Plaza Francia and is a good respite from the crowds of the market. Picnic tables under strings of lights, it's got ambience. Rest your feet with a beer and a snack. EL SANJUANINO | Posadas 1515: Ya'll, these empanadas. They're damn good. PONYLINE or ELENA @ FOUR SEASONS| Posadas 1086:; Ponyline is the bar at the Four Seasons, is very hip, and has a mean burger. Elena is their nicer restaurant, reservations recommended. I'm not one for the fancy eating, but Elena is one of the best restaurants I've ever been to! You can't beat the quality of their food with the high level Four Seasons service. LA CHOLITA | Rodríguez Peña 1165: La Cholita is very affordable. It's a parilla and serves great meat at great prices. Order a pinguino of house wine and enjoy! CUMANA| Rodríguez Peña 1149: Next door to La Cholita is Cumana, if the line is too long at one, try the other! Cumana serves traditional food from the north of Argentina. Order a cazuela (or stew), like locro, or a tamale or humita, to try something different from all that steak. Prado y Neptuno | Ayacucho 2134 | Have a seat in the mid-century furniture and order a negroni here. If you're into cigars, you're in luck with their walk-in humidor. Milion | Paraná 1048 | I think this bar is a MUST for any visitor in Buenos Aires. The stunning mansion is worth the visit alone, the cocktails and patio are just a bonus.